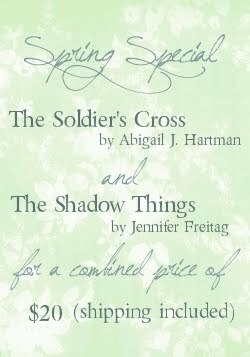 Abigail and I are offering a spring sale on our books The Shadow Things and The Soldier's Cross, from now until April 30. The books will be available for $20 (combined, not each), including shipping, and will also be autographed; if you would like a specific note in each, post a comment with the desired inscription, or email Abigail (jeanne@squeakycleanreviews.com) or me (sprigofbroom293@gmail.com). If you enjoy the books, we would love it if you posted your thoughts in an Amazon review! A.D. 1415 - Fiona's world is a carefully built castle in the air, made up of the fancies, wishes, and memories of her childhood. It begins to crumble as she watches her brother march away to join in the English invasion of France. It falls to pieces when he is brought home dead. Robbed of the one dearest to her and alone in the world, Fiona turns to her brother's silver cross in search of the peace he said it would bring. 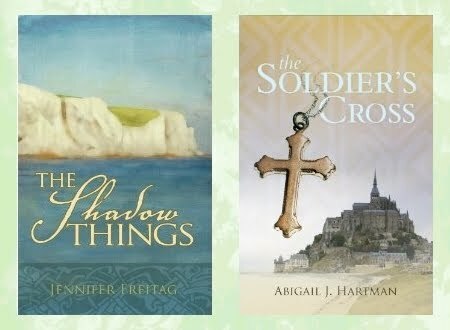 But when she finds it missing, she swears she will have it and sets out on a journey across the Channel and war-ravaged France to regain it and find the peace it carries.